Managing your social media as a part of your greater marketing strategy is no easy task. Although social media is much more cost effective than other forms of advertising, the time commitment, resources and staffing required to execute it properly can be quite a commitment for an organization of any size. Every business is different when it comes to internal organization, as well as the goals they are trying to achieve. As a result, the team necessary to properly manage your company’s time, resources, and benchmarks on your social channels vary greatly from organization to organization. 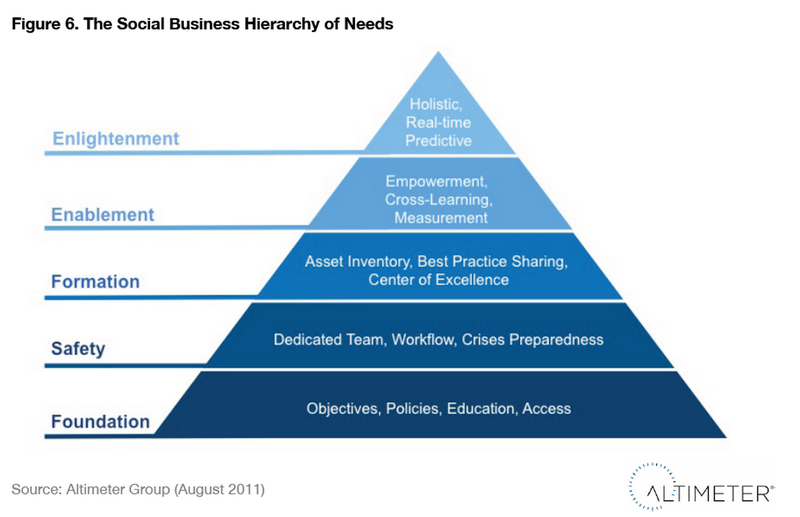 Even if there isn’t an exact formula for putting together a team to manage your social media, it’s critical to properly integrate social across your entire staff and organization to properly meet the needs of the social business hierarchy. According to Hootsuite, companies leveraging social technology can unlock up to $1.3 trillion in annual business value. Therefore, properly ensuring your entire organization and staff is on board with your social media marketing efforts can drive worthwhile results leading to greater visibility, increased revenue, stronger relationships with your customers, established thought leadership, and more. Here’s how to effectively staff your social media team from the talent across your organization. To ensure your organization is able to genuinely bring the entire company on board with social media marketing, senior level leadership must buy in to the use of social—as well as your approach. Today, it’s less about convincing executives that social media is important, and more about the results it can drive for your particular organization. Focus on illustrating the ROI of social media for your company by drawing on industry data, comparing the effectiveness of social as compared to TV and other traditional mediums, and estimate the potential results you’ll be able to achieve with your investment. By establishing the buy-in of your leaders, you’ll be able to better articulate how your organization will address social across department with more support and resources allocated to your efforts. After establishing buy-in from leadership, it’s critical to coordinate your entire staff when it comes to how they should be interacting and using social media on behalf of the business. Establish proper social media policies for your organization, followed by formal training to bring each staff member to a basic level of understanding on how to use social to drive results for the business. Company-wide education is required in order for every department to build the necessary skills and knowledge that will help your business prosper from this vast income potential, while avoiding any social media catastrophes in the process. Once your organization has established both a social media policy and company-wide training to bring all employees into the fold, it’s critical to develop an in-depth social media strategy to align your short-term and long-term efforts across departments who will be dealing with social media regularly. There are touch points with social media across every department, but some manage social media more extensively and therefore need a thorough plan of action for their ongoing efforts. Your strategy should outline the goals of using social media, the tactics to reach those benchmarks, the resources needed to execute effectively and the metrics you’ll use to help review the success of your efforts. This strategy should clearly address the buyer personas your company is trying to reach on social media, which informs what channels you’ll be active on, what types of content you’ll be sharing and what topics you’ll be covering with that content. These buyer personas allow your team to directly address your target audience’s unique preferences and ensure that your offerings are presented on social media to match these preferences. An in-depth strategy will ensure that your most active contributors across the organization are working towards similar goals and driving long-term results that impact your business. According to All Twitter, sales with social enterprise solutions will increase by $4.5 billion by 2016. It’s critical to bring your sales team up to date with social media to gain the attention of prospects, better map their journey across the sales funnel and continue to build better profiles about them as part of your social CRM. Every interaction your sales team is having with potential customers should be informed with data gathered from their presence on social media, whether it’s time spent on Facebook, Twitter, LinkedIn or elsewhere. The training your organization puts into place should help your sales team prioritize using social media to build long-lasting relationships focused on people first and the technology used to facilitate those relationships second. 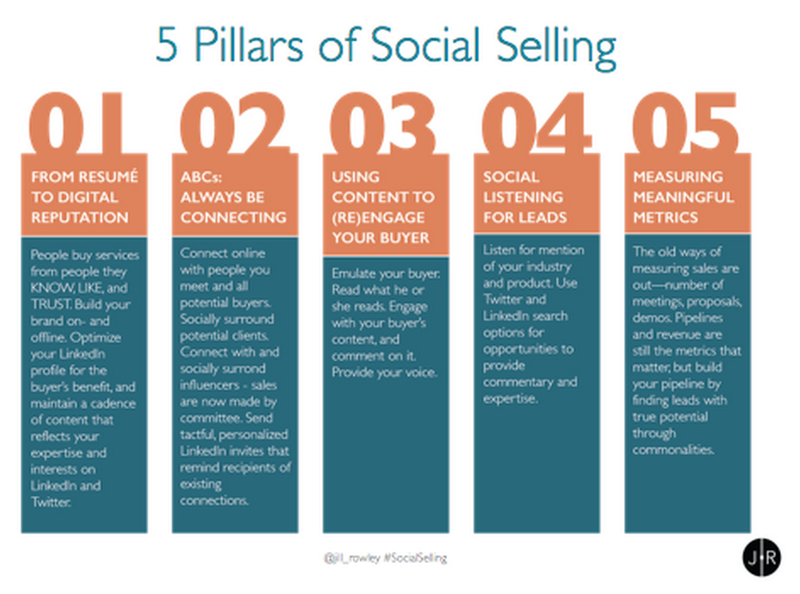 Incorporate the five social selling pillars, as coined by social selling evangelist Jill Rowley, into your strategy to increase your understanding around using data from social media to better listen and engage with your prospective leads to help drive results and re-engage your buyers. Your social media training and strategy should directly address the needs of your customer service department, as they will regularly deal with issues your audience is facing across your social channels. This requires your customer service team be both proactive and reactive on social media around the clock. Start by listening and monitoring conversations around both brand-related keywords and hashtags to react to comments, questions, concerns and issues your audience is facing. Be proactive as well by posting times that your customer service team is actively monitoring conversations on social media, create accounts for your team that solely handle customer service concerns and make it clear that your organization is always looking for feedback on improving customer experience. As a part of the core foundation of your how your social team is staffed and ran properly, it’s critical to include the involvement of legal and HR in your social media marketing efforts to ensure compliance of company policies and procedures. From a legal standpoint, your company’s use of social media must follow all policies established internally and any other regulations that your business and industry must adhere to when it comes to the messaging you’re sharing with your customer base. By properly syncing your legal team with the rest of your organization’s use of social, you’ll ensure your business remains complaint. According to Mashable, businesses saw a 43 percent improvement in quality in the hires that were located from social media. This is one reason, among many, to bring HR into the fold with the proper use of social media. With the correct use of social media, HR is poised to acquire more quality staff and keeping existing staff satisfied in the process. Your marketing team should be the leader in the ongoing integration of social media across your company as they typically work the most closely with these channels. Unfortunately, many organizations leave the sole control of social media in the hands of marketing and then it remains within a silo and leads to many missed opportunities. Instead, position marketing as the lead partner that spearheads the integration of social media and the framework for ongoing company-wide training. The marketing department should be responsible for keeping the company updated on the proper social channels to be active on, the tools to help manage the process, the content they should be producing and how to continue to stand out as a thought leader in the industry. What steps has your organization taken to better equip your team with the use of social media marketing? Share your experiences in the comments below. 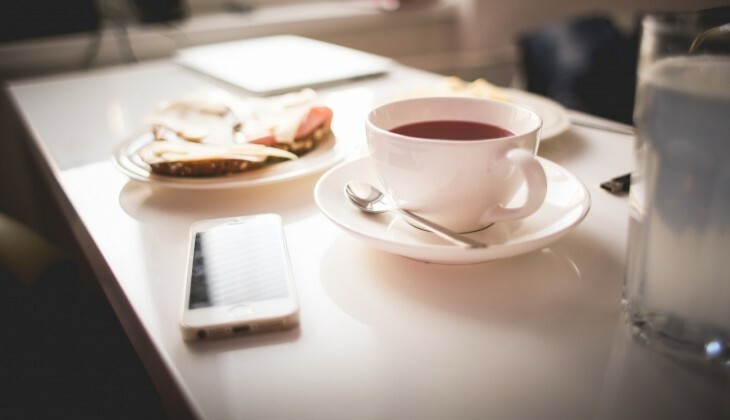 This post is part of a series titled “Business Social,” and is brought to you by Hootsuite.